Finally, "Clash of the Titans" is here. Since seeing its sneak peek last year, we have really been excited to see the end product with our own eyes. It seems the movie is action-packed from end to end and with Sam Worthington and Liam Neeson at the helm, the 2010 remake of the classic 80's film seems to be going to be a huge success. 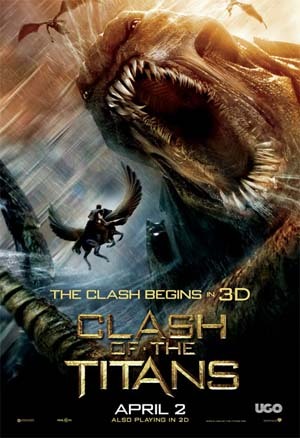 "Clash of the Titans" touts to be another film that is going to use 3D, for better or for worse. With all the Greek Mythology-themed films coming out recently, can "Clash of the Titans" make a distinction of its own or is it just another riding with fads (both as a 3D film and a a mythological film)? Read on to find out our verdict. Perseus (Sam Worthington), half human half god feels nothing but hatred for Hades (Ralph Fiennes), the god who murdered his adopted family. Hades, the brother of Zeus (Liam Neeson) threatens to release the monster Kraken to destroy Argos, a city full of humans who have become disrespectful to the gods of Olympus. Perseus more than willingly volunteers to lead the pact who will stop Hades as he finally gets a chance to exact his own revenge. He is joined by a courageous bandit of humans, all with the same dislike towards the gods. They have ten days to find a way to stop Hades and the Kraken or else all life in Argos will end. "Clash of the Titans" will make you wish you did not get too excited about it and even more if you paid a premium price for the 3D version. It was not hype that killed the movie but because it was made at a really sub-par level. To summarize it all up, "Clash of the Titans" was just mediocre both as a 3D film and mythological film. The action sequences were outstanding as expected but it left us wanting more battles and more monsters. Heck, even "Percy Jackson and the Lightning Thief" had more monsters than this. Maybe some will say it was a remake and it might have followed the original story but we beg to differ because we think some key plot elements were changed already in the first place. Worse, the film's story was sloppily made and very outlandish in our opinion. We even found ourselves yawning several times. Greek mythology fans will really hate the film for sure. Finally, the 3D version was not worth it. What's will all the film outfits being starve crazy in making films into 3D? With what's happening, the industry will surely suffer in the long run. We just hope the fad stops already. We like 3D no doubt but for those films that truly utilize the technology - not just as a cash making scheme. "Clash of the Titans" was a film with action sequences but nothing much. Our suggestion - skip the 3D version and save some moolah or maybe you could just skip the whole film and save more money still. Labels action, adventure, Clash of the Titans, epic, Liam Neeson, Ralph Fiennes, Sam Worthington, Warner Bros.